Family and friends are over the moon for Chris Pratt and Katherine Schwarzenegger. Just hours after the couple announced their engagement on social media, a few familiar faces couldn't help but congratulate the pair on the new relationship status. "Love you," Maria Shriver commented on her daughter's Instagram. "Enjoy this next chapter. Make it fun. You are so loved." She would also express her well wishes on Chris' announcement post. "Congratulations to two loving, kind, caring, thoughtful, spiritual people," Maria expressed. "We are so happy for you. You are blessed as is everyone who knows you. Yes, let's go." Katherine's younger brother Patrick Schwarzenegger added, "Love you brother." Now, E! News has learned more details about her family's reaction to the engagement. "Maria has known from early on that Chris and Katherine see their future together and want to get married. The family is completely supportive and can't imagine anyone more perfect for Katherine. When you know you know and she definitely found her Prince Charming," a source tells E! News. "They are over the moon that he proposed and that they are taking this next step. Maria was not surprised and knew it was coming. They had discussed it at length and he asked her permission. She already treats Chris like a member of the family, but she's excited to make it official." "It will not be a long engagement and they can't wait to start planning the wedding," the insider adds. "There will be no expense spared and they want to give Katherine the perfect day." It was a big weekend for the Hollywood couple who has experienced an unforgettable romance in the public eye. While Chris enjoyed an evening out with his son Jack at Monster Jam Saturday night, many believe the actor popped the very important question on Sunday. 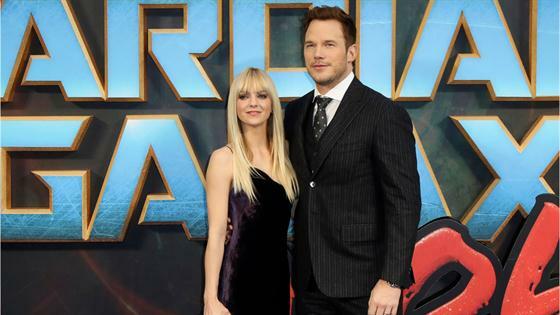 Since then, the response has been overwhelmingly positive including from Chris' ex Anna Faris. "I'm so happy for you both!!" she wrote on Instagram. "Congratulations!" Of Katherine's relationship with Chris' son, who he shares with Anna, a second source tells E! News, "Jack really likes Katherine and feels comfortable with her, she's very nurturing and great with Jack. They have a special bond." The insider also adds that Chris is "very thankful" for Katherine and can see a "sweet future together." As for what makes Chris and Katherine work so well, sources say they have many similar thoughts when it comes to family and faith. "Everyone has their fingers crossed that this is going to work out long term. They think Chris is an amazing guy and a great catch," a source previously told E! News. "They are really perfect together and have similar goals and values."